Study the design of steel building structures per the 2005 unified specification, ANSI/AISC 360-05 Specification for Structural Steel Buildings with this key resource. 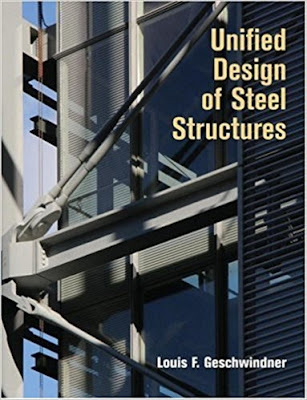 Author Louis F. Geschwindner first builds the foundation for steel design and then explores the various member types in more detail. He provides guidance for those new to the field as well as an excellent review for practicing engineers looking to learn the provisions of the unified specification and to convert their practice from the old specifications to the new one. Chapter 1 includes an expanded discussion of structural integrity along with a discussion of the timing of adoption of the new provisions into the International Building Code. The integrated project introduced in this chapter for use throughout the book has been relocated to a new city from the 2nd edition and the framing system modified. This will provide new homework options for those who have implemented this project. A computer model using the RAM Structural System will be available on the book website to support inclusion of the integrated project in courses. Finally, an expanded discussion of reliability and statistics as it applies to structural steel design has been included. Chapter 2 provides an expanded discussion of snow, wind and seismic loads and additional calculations for these environmental loads using ASCE 7. Chapter 3 discusses the new steels approved by the 2016 Specification and the new approach taken by ASTM to the specification of high strength bolts. Chapter 4 addresses tension members. The provisions have not changed, but there has been a revision in standard hole sizes for bolts. These new sizes have been implemented in the examples where appropriate. Chapter 5 looks at compression members, and the Specification nomenclature change of KL to Lc has been implemented. A section and an example have been added to address gravity-only columns and their influence on the effective length of columns in lateral load resisting systems. The completely new approach for treatment of columns with slender elements, introduced with the 2016 Specification, is addressed. Single angle compression members and built-up compression members are discussed and examples provided. Chapter 6 on flexural members includes a discussion of the shape factor and its significance. The use of Manual Table 3-10, the beam curves, with Cb not equal to 1.0, is expanded and a new example is included to illustrate the use of Manual Table 3-2, the economy tables, for noncompact beams. The treatment of tees, single angles and double angle beams has been expanded and examples included. Determination of shear strength for wide-flange members when the reduced resistance factor or increased safety factor must be used is now illustrated. Chapter 7 addresses plate girders as doubly symmetric I-shapes built up from plates. It now includes a discussion of these plate girders with compact webs. The completely revised treatment of shear in plate girders included in the 2016 Specification has been incorporated, and the corresponding stiffener design has been expanded.